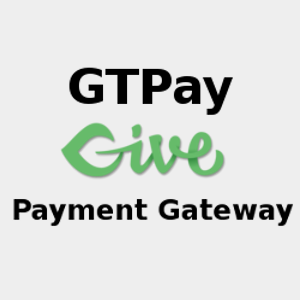 GTPay Give payment gateway plugin allows you to receive Donation payment on your WordPress site using Give. Give is the most flexible, robust, and easy to use WordPress plugin for accepting donations directly on your website. Upon activation, Give provides you with powerful features geared towards helping your Cause. Accepts donation payment through GTPay. To use this plugin you need to install the Give – Donation plugin. Click here to know more about the Give – Donation plugin.